The module is tailor-made and customized to match the scholarly wavelength of every HCEitians and bring out the special edge in them. The curriculum of HCE equips students to succeed in any organization. The HCE experience enhances the repertoire of skills the HCEitians possess. The HCE experience magnifies their intrinsic qualities to excel in leadership position in any corporate set-up. The HCE cohort is a confluence of knowledge and expertise from diverse industry domains creating a rich chiaroscuro on campus. The amalgamation of this depth and diversity of experience with newly acquired kills make HCEitians an ideal choice for recruiters. At HCE, the actions are guided by the philosophy of continuous progression and incessant pursuit of perfection. With its advanced pedagogy and need-based curriculum, the college aims at providing balanced learning to the students. 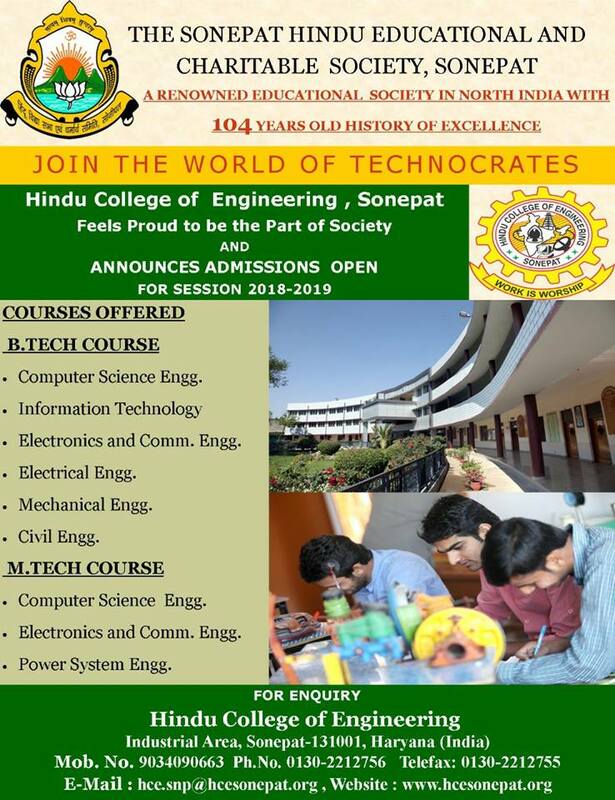 HCE, keeping in pace with the latest, brings the most modern and the most sophisticated of the technology to its campus. The motive is not just to be tech-oriented, but making the students have a brush with the latest and the most happening technological innovations hitting the scene. Faculty Members are meant to infuse and develop in the students the analytical, conceptual, presentation, communication and application oriented skills. The Class Rooms and Lecture Halls are well furnished with advanced teaching aids like Multimedia Projectors and other technical equipments which make teaching more intense and interactive. The simulated teaching softwares help the students to understand the process in highly visualized way. The entire campus has 24X7 Wi-Fi connectivity. The students are encouraged to maximize their learning and computer skills by constant use of their computers/laptops for research, project works, presentations, assignments, forms filling etc. Load shedding and power failure has become a way of life. To overcome this problem, the Institute has a dedicated HT power supply, generator back-up and Online UPS especially for all the laboratories & conference halls in the departments, library section, accounts office and training & placement cell. The Institute has a firm belief that security and safety of the inmates are also an integral part of its service in the educational sector. Availability of dedicated team of Security Officers and personnel. CCTVs are installed at various prominent places in the campus for 24 hours surveillance. Housing megalith buildings, state- of- the- art libraries & laboratories, hostels accommodating more than 200 boys & girls; HCE sets precedence in creating high-class infrastructure. We provide the best to our students, because we want to derive the best out of our students. HCE Campus doles out plentiful opportunities for students to rewind after a hectic day at class room, providing beautiful gardens, sizzling cafeteria and green lawns. Free from the hustle-n-bustle of big towns, it provides a serene and still environment stimulating the sense of aesthetics in the students. Unquestionably, an aesthetic mind delivers more and delivers quality! Punctuality is of utmost importance for any good professional institution and same is encouraged. Camera Mobile is banned in the campus. Any act of students which will adversely affect the academic ambience of the institute, will be punished by disciplinary committee. Use of alcohol, cigarettes, tobacco and gutka is not permitted in the campus. The students are directed to attend their classes REGULARLY AS PER TIME- TABLE. The students having poor attendance shall be debarred from university examination. The students are required to wear/carry their IDENTITY CARD in the college. Students Identity Card maybe checked in college campus or at the gate. The students are NOT ALLOWED TO INVITE ANY OUTSIDER within the college premises without prior permission of the Director-Principal. The students are warned that they shall not indulge in “RAGGING”. The students are directed NOT TO SIT IN COLLEGE PARKING. Girl students are requested to report the incident of EVE TEASING or any other form of sexual harassment in/around the college campus to woman grievance cell or Director –Principal directly. In case of any grievance(s) or emergency, meet the Director- Principal immediately and directly in his office. This is a Ragging free Campus.